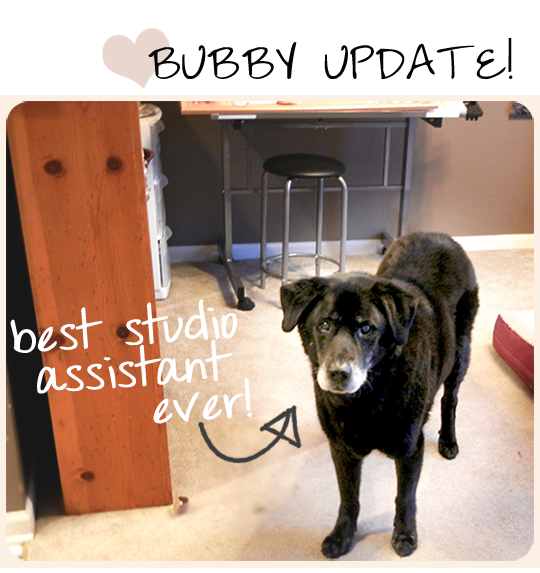 Bubby and Bean ::: Living Creatively: Update: Bubby Dog is a Rockstar! Update: Bubby Dog is a Rockstar! It's been a while since my last Bubby dog update, after the terrible night when he had a seizure. For those who aren't aware, my sweet 15 year-old Lab/Chow mix doggy, Leary ("Bubby," and the inspiration behind Bubby and Bean), was diagnosed with terminal cancer April 22nd. He was given a few days to a few weeks to live, and I'm so grateful to be able to say that today has officially been 5 weeks! This doesn't mean that quantity is more important than quality, but we've been very lucky in that he's been doing really well. In fact, the vets tell us that the problems that he has had - the seizure, some hind leg weakness, and a hefty case of separation anxiety when the fiance has to go on the road with the band - have no connection at all to the cancer itself. Bubby even got to go into the vet on Tuesday for an ear cleaning, quick check-up, and mani/pedi (he does not like it when we attempt to cut his nails, so we leave it to the experts). This was kind of a big deal for us, since we were certain he would never be going back to the vet again for anything routine. Everyone there was so excited to see him, and he was pretty excited too - to the point that he was panting so hard that they weren't able to check his heart with the stethoscope, and had to give him an EKG! 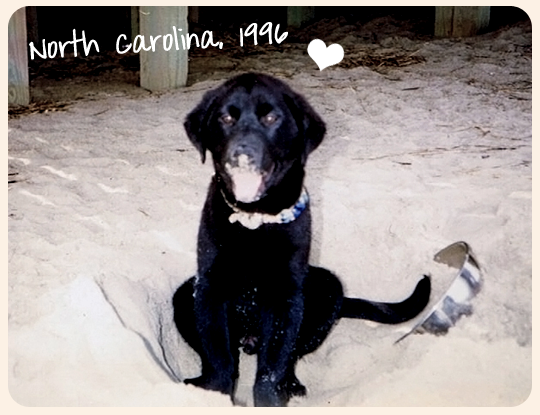 His heart, ears, teeth and ridiculously cute face were all in perfect health. Things haven't been all sunshine and rainbows, of course. In addition to the scares and random health issues, Leary really can't be left alone for any extended periods of time, and he is not a happy camper when his dad's gone. So I've become slightly sleep deprived, and I've been working much longer days, since it's more difficult for me to get things accomplished in the daytime. (I've heard lots of "welcome to my world!" from my friends who have young human children!). But every sacrifice is more than worth the extra moments I've been able to spend with the sweetest creature I've ever known. Bubby wins out over the missed social events and adequate sleep, hands down. I can't thank you all enough for your amazing show of love and support for this special boy. So many of you have emailed me or commented to ask how he's been, and it means a lot to us. There are undoubtedly people who think I'm slightly crazy for being so attached to a dog, but there are also many others who completely understand the profound connection humans can have with animals. I feel so lucky to have been blessed by the universe with one of these connections! You are the best readers ever (Bubby thinks so too), and I'll be sure to continue to keep you updated. See you tomorrow morning for this week's edition of Saturday Morning Daydreams! I have just a few sponsor spots left for June (including just 2 of the new small size for $10!). If you have a blog, Etsy shop or small business that you'd like featured here next month, you can get more information and purchase an ad directly on the sponsor page. I'm so excited for the new layout/ad sizes and all of the amazing new (and return!) sponsors - hurry up June! You might just be the best dog mommy in the whole wide world!! I've been wondering how that little cutie was doing. Thanks for updating us. Bubby has a lot of fan! so glad you have had the extra time to spend with your love, i completely understand your love for your dog - i feel the same way about mine!! So glad to hear Bubby is still doing okay and happy! I would be exactly the same way if I had a dog; I completely understand. Go Bubby go! I look forward to all your pretty design and eye candy posts everyday but I have to admit I've been anxiously awaiting a Bubby update. He's famous! I'm so happy he's still doing so good. He is such a handsome dog! Hey sweet pea. I am so glad that Bubby is feeling a little better at least, it so frightening when your beloved pet is poorly. I have a new puppy, and I am costantly waking up to check on her breathing-just like I did with my daughters when they were babies. i'm glad he has been doing so well. poor baby. i completely understand. i'm incredibly attached to my kitty Milo.